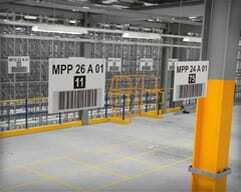 Warehouse Hanging Barcode Signs with Reflective Labels, Nationwide Installation Services and Warehouse Barcode Solutions. Bar code signs and labels are a specialty of ASG Services, our production facility in Norcross, GA, is equipped to handle custom made identification products for the warehouse and distribution industry, with the room to process 50,000+ units at any point, without impacting on other production processes. The tailored design service we offer with all products, identifies the commitment we place in serving customer needs. layout formats are developed from specific requirements or can be based on our project archive. 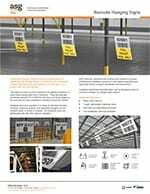 Single sided configurations are the most popular, however some customers are able to use double sided or two-faced hanging formats which can be produced in a range of sizes and formats and our multi-faced zone displays, 3 and 4 faced allowing multi angle and direction visibility. ASG Services’ placards can be created with a complete range of content, including high definition print imagery on retro reflective material, alpha, numeric and alphanumeric permutations as well as color coding and images. Thanks to our specialist software, we are able to produce multi field hanging sign displays from vast amounts of variable data with ease. 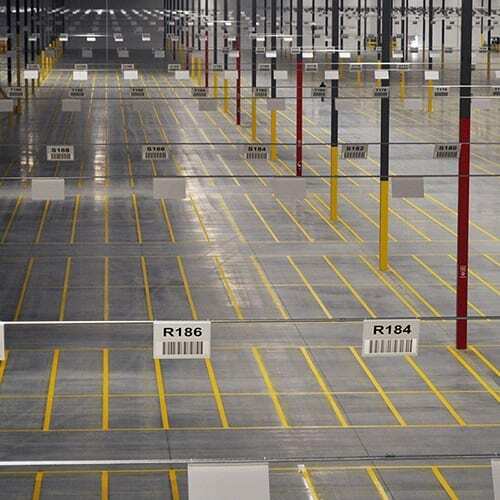 Distribution facilities use hanging signage as a fix and forget solution for floor storage identification. We utilize the latest developments in base materials to produce robust and cost effecting location signage. We have various options which allow ASG Services to offer customers products for internal and external use. Our hanging placards are developed with installation practices in mind. We can provide them with holes pre-drilled, hardware included and in sequences to suit the location runs. ASG Services is the leading provider of fully managed installation services, our teams are fully trained and insured to work on any customer site throughout the US and beyond. Their work on projects has created the expertise and experience needed to apply attention to detail and accuracy needed for complete and successful installations every time. 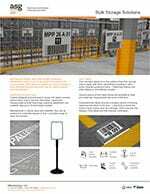 Their knowledge also extends to the complexities involved in fitting such systems, where cable tension, cross forces and impact potential must be considered, before any hanging sign is installed. Hanging signage would always be our preferred choice for customers wanting to identify a floor location. 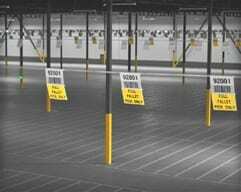 Floor labels are effective but susceptible to damage and can become a costly consumable item, were as the hanging option is attached to structure out of reach of forklift trucks or people and therefore last as long as you need them. If you have questions just call, we are happy to help and understand the complexities, which might be new to you. Send all the questions, details, pictures and drawings you have and we'll get the best information and response to you as soon as possible. You can buy these online from our store, but if its a large amount then its best to contact us for best pricing.